Eva Marcille has talked all season about how NeNe Leakes is “a big sister” to her. She even asked NeNe to speak at her wedding reception. Why would Eva not ask someone who is a major part of her wedding to attend the bachelorette party? She invited Porsha Williams to the event, but none of the other Real Housewives of Atlanta cast members. Most of the women were not bothered by the snub (I don’t blame them). However, no one understood why Eva did not invite NeNe. It feels like Eva is in the spotlight every single episode this season. That is because she offends her costars on a regular basis and becuase there is pretty much nothing else happening this season on RHOA. During the last episode, the Atlanta Housewives interrogated her about the bachelorette party snub. But before that, Marlo Hampton shaded Eva left and right. She walked into a bedroom and declared, “This room has no character. Just like Eva.” Although that was unnecessary, it was admittedly hilarious. However, Eva has been shading Cynthia Bailey alllllll season, so somebody needs to check her. Thank you, Marlo. 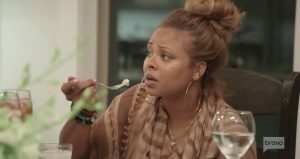 TELL US- ARE YOU TEAM MARLO HAMPTON OR TEAM EVA MARCILLE? SHOULD NENE BE OFFENDED BY THE SNUB? DO YOU WANT EVA TO RETURN FOR ANOTHER SEASON?